This entry was posted in Welcome and tagged Armstrong County, Kittanning, Local4All, Western PA. Bookmark the permalink. 4 Responses to Welcome (back) to Kittanning! Comments will be moderated but join in the fun. 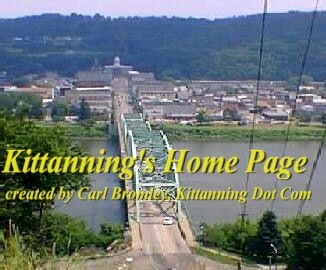 What happened to the Kittanning online walking tour? Just wondering! Jill, take a bow… you are the first to tell me about the broken link to the Walking Tour. Thanks and enjoy. I couldn’t find a place to start a new thread… I left Kittanning in 2004 for Atlanta, and have lost touch with 2 friends I’d like to communicate with again. If anyone knows the whereabouts of Diana Bauer or Bob Winter (or either of his sons, Ryan and Evan), please let me know. Bob used to work at Armstrong Microelectronics, which also became Beyond Wire, but it seems they have moved or gone out of business. You can email me at laura@laurafranklin.com or laurafranklin86@gmail.com. I don’t know if I’ll get notified if someone responds to my comment. Thanks!